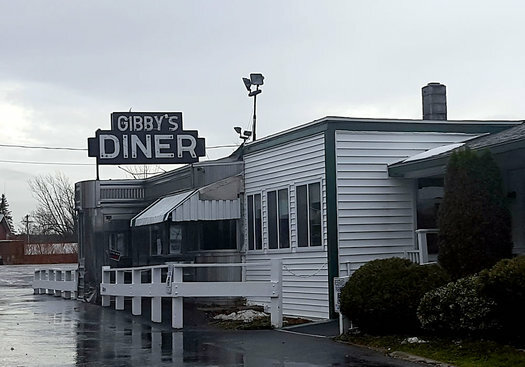 There's plenty of things that Gibby's Diner, in the tiny hamlet of Quaker Street in in the town of Duanesburg, does well -- but one thing it doesn't do is screw around with portions. The classic diner car has been in business since 1952 and little has changed in the 60-plus years of operation. Passers-by come for quick food on the road between hither and thither, while the regulars expect the expedient service and solid food served with a smile and a side of sass. Your transaction at Gibby's isn't complete unless you are waddling out of the cramped chrome-and-neon coated entrance. Homemade breads and pies and in-house roasted meats make sure that happens, but nothing guarantees the gluttonous feeling (shame?) quite like the Gibby's breakfast sandwich. The first thing that should concern you is the fact that the sandwich comes with a steak knife inserted through the middle. Like a boyhood Arthur mounting the stone in Westminster and brandishing Excalibur, you too will attempt a mythical feat once you unskewer the knife from the sandwich. The sheer size of the sandwich makes it notable on its own -- six inches across, or roughly the size of a salad plate. But the fact that it also tastes delightful makes it worthy of a special trip. 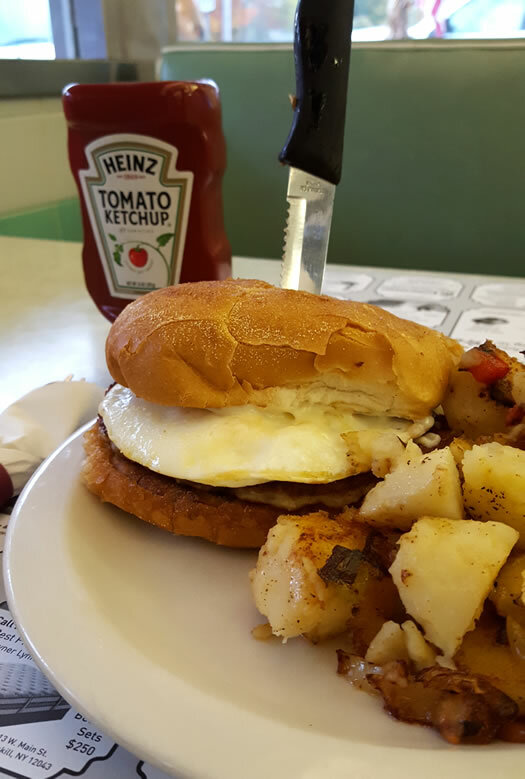 The sandwich ($6.25) is served on a soft Kaiser-style sandwich roll that is toasted and buttered, then topped with two eggs and your choice of cheese (go with American, the optimal melty breakfast option). A full order of breakfast meat -- sausage, ham, or bacon -- is nestled in next. I opted for sausage, which resulted in two patties each the size of most thin-style hamburgers. If the sandwich is any indication, breakfast at Gibby's is an affair with a carnivorous focus. Eggs, dairy, and bread are presented only to offer balance. The sausage is zippy and generouly seasoned and not the least bit greasy or unctuous. Whatever fat does remain is sopped up by the light, lofty roll, despite the buttery coating. The eggs are also cooked in a pat of butter, leading to a rich, decadent, filling, and not the least bit healthy breakfast. 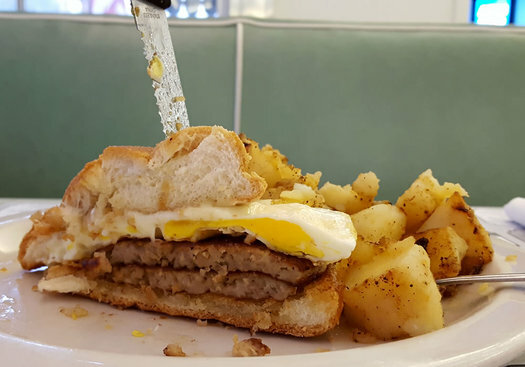 A side of homefries come scattered around the sandwich, barely fitting on the plate due to the enormity of the brekkie sammie itself. The sandwich is only served until 11:30 am Wednesday-Sunday, with minor apology given due to the size of the kitchen. Exceptions are rarely, if ever, granted. Good -- sometimes great -- breakfast sandwiches are easy to find in the Capital Region. From the steamy McCarroll's version in Delmar to the Taylor Ham-and-bagel option at West End Bagels in Clifton Park, breakfast sandwiches are a thing that we have down pat. Gibby's follows suit, serving up the same gargantuan sandwich that generations past also enjoyed. Whether or not you use the steak knife to divvy up your sandwich, though, is part of the Gibby's legacy you'll need to write for yourself. I love eating at Gibby's! It doesn't matter what you order it all tastes great, but I do have my favorites. They make the best chocolate milkshakes I've ever had.